A single electronic billboard in Times Square consumes enough electricity in a year to power thirty homes. This exorbitant energy requirement is not exclusive to large billboards: many other electronic devices, such as cell phones and computers, use a wide variety of power-hungry displays, which must be consistently backlit to maintain readability. Current digital display technology is not only energy inefficient, but also costly and inaccessible to populations in rural areas of developing countries. In a world where digital displays are becoming increasingly more ubiquitous, there needs to be more research done towards making digital display technology more cost and energy efficient so that digital media can be more accessible and environmentally-friendly. 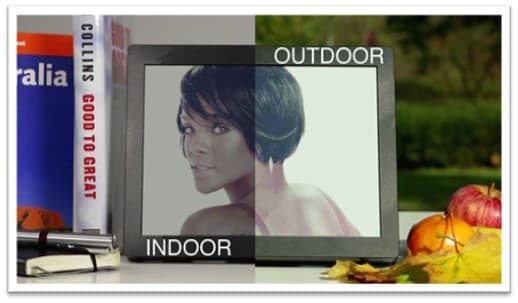 With regards to reducing energy consumption, paper-like displays are a more efficient alternative to traditional displays because they do not need to be backlit to function. In addition they do not need to be constantly refreshed, leading to less power draw. Image displaying an e-paper based display. Team VOLTAGE is researching how bistable electrowetting-based displays can be designed and fabricated in a low-cost manner in order to reduce the power used by digital displays. In an electrowetting-based display (EWD), each pixel contains a drop of colored liquid to which voltage is applied in order to change its shape and thus the color of the pixel. EWDs have the potential to become more prevalent around the world; however, they are currently not readily available. This is due to the fabrication complexities, high costs, and a general lack of research in the field of EWDs. Pixels in a bistable display only need to be refreshed when they change color. This allows for reduced power consumption and more efficient use of energy. 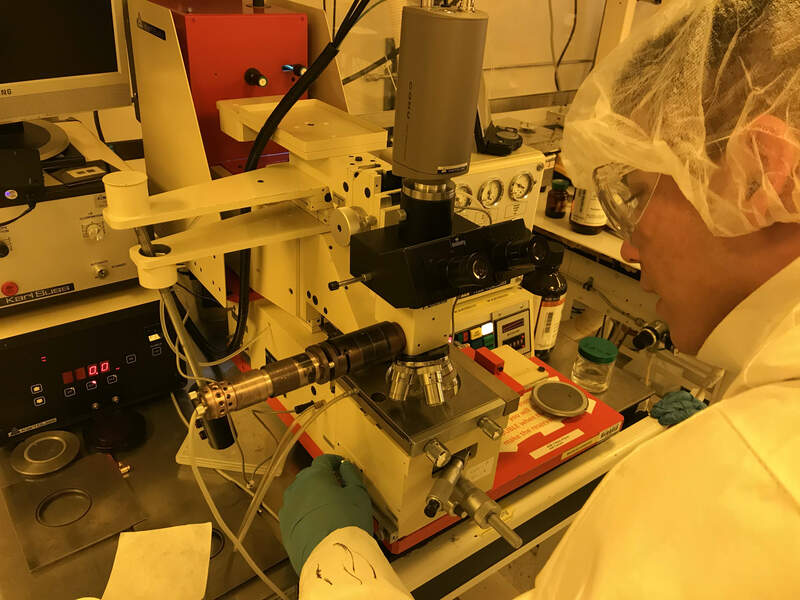 The team is currently hard at work in the NanoCenter Fab Lab working on using photolithography to create pixel structures and unique electrode patterns. Team member Chris Hallock inspecting the results of a photolithography session. Microfabrication costs are not cheap. Screen components must be fabricated and assembled in a clean room for which we must pay an hourly fee. Money we raise from the launch campaign will go towards time spent fabricating screens as well as the materials we need such as SU-8 photoresists and ITO-coated glass. Through your donations we can continue funding our research and building more accessible screens. Your donation will allow us to purchase basic lab equipment and circuit components like pipettes and transistors. You will receive a thank you email and acknowledgement on our website and in our thesis. Your donation will allow us to buy ITO coated glass which is an essential component of our display. You will receive a thank you email along with acknowledgement on our website and in our thesis. You will also receive an electronic holiday card. Your donation will allow us to purchase dye purification materials to create colored pixels. You will receive a handwritten note and a 3D printed pixel structure, as well as all gifts from lower tiers. Your donation will allow us to reserve time in a clean room at the NanoCenter Fabrication Lab. You will receive a Christmas card, as well as all gifts from lower tiers. Your donation will allow us to purchase 500 mL of photoresist to continue fabricating pixel structures. You will receive an autographed picture of the team and a copy of our final thesis as well as all gifts from lower levels. Your donation will allow us to reserve enough clean room time to fabricate an entire screen from start to finish. You will receive a samples of our work as well as all gifts from lower levels.